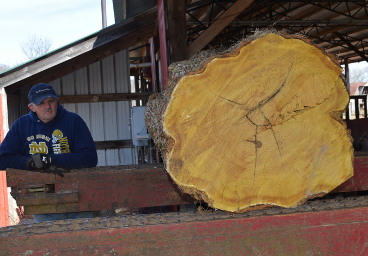 The Back came from the straightest, tallest Osage Orange tree I have ever seen. The bridge is ebonized osage orange. It's weight and elasticity make it a fabulous bridge wood. A previous customer asked me to make him a rosette out of a spalted piece of oak firewood and I used it on a few guitars. Early explorer of the American west, John Bradbuy, noted in his journal that the value of a good Osage Orange bow was worth a horse and a blanket. I don't really have a place to put a horse, so I guess my base price will work for this guitar. It's the first of it's kind from my shop that excludes a lamination of the back and sides, but there is nothing from it lacking in quality. If you are interested then ask me about the wide palette of colors, the traditional "attack" and cavernous basses. It's nice to finally hear a guitar made from this wonderful wood that has a rich American history.